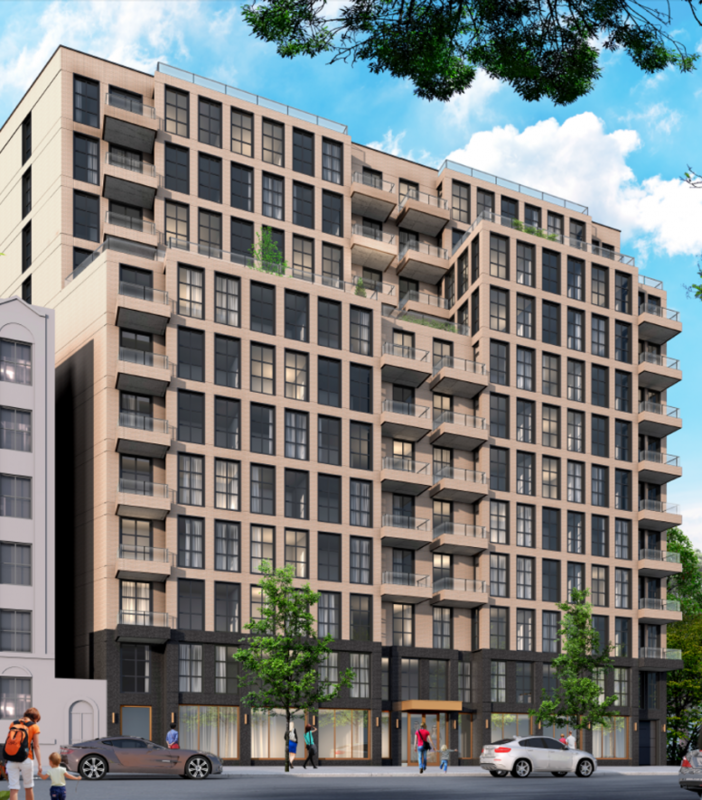 One of the largest new residential projects filed in Crown Heights last year was 111 Montgomery Street, a 12-story apartment building planned for a lot next to the Brooklyn Botanic Garden. Developer PWR Holdings has put the site on the market, and YIMBY has a rendering for the building that could rise there. Last year’s new building applications call for 162 apartments divided across 132,000 square feet of residential space, yielding average units of roughly 814 square feet. If the new developer goes forward with the current plan, they’ll build 38 studios, 65 one-bedrooms, 53 two-bedrooms, and six three-bedrooms. The building would also have a 71-car garage underground—which is just enough to satisfy zoning requirements. The Department of Buildings approved the plan exam application in June. But brokerage TerraCRG wants to market the property as condos rather than rentals, and they’ve proposed fewer, larger units. Their offering memo details a building with 137 units—44 one-bedrooms, 75 two-bedrooms, and 18 three-bedrooms. They also claim that condos at 111 Montgomery could fetch up to $1,100 a square foot. That’s certainly at the top end of the market for prices in the hood, but it’s comparable to apartments for sale north of Eastern Parkway. The 22,000-square-foot lot sits between Franklin and Washington Avenues, just west of the shuttle train tracks. Karl Fischer created this design. While it isn’t particularly exciting, it does have a setback starting at the seventh story, which helps maintain the street wall with the six-story prewar buildings next door. The first two floors are clad in a dark brick, accented with golden metal window frames, topped by 10 stories of sand-colored, cast concrete. 1 Comment on "Revealed: 111 Montgomery Street, Crown Heights"
LOL at that “rendering”. What is wrong with the balconies on the left?! I assume this is just bad Photoshopping and not actually fun-house architecture.